Image caption Mr Buttery said the indoor skate park was "long overdue"
Proposals to turn a warehouse into an indoor skate park "will make a positive impact" on the Isle of Man's young people, a skateboarding group has said. The Shred House Ltd has submitted plans to turn a unit on Carr's Lane in Tromode into a riding space for skateboarders with ramps and obstacles. The 4,000 sq ft (370 sq m) site will also serve scooter and BMX riders. 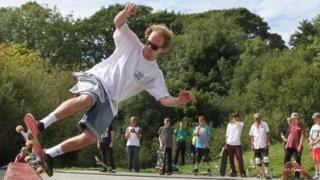 Isle of Man Skateboarding's Christopher Buttery said Manx skateboarders "have been waiting for this for years". "I hope the people of the island will back this project as it will make a positive impact on the youth, who can be often overlooked," he added. The firm said when completed, the facility - which would become the island's first indoor skate park - will open to members of all ages and abilities on evenings and weekends. The proposals follow the announcement that work on two new outdoor skate parks in Douglas and Castletown will start later this year.